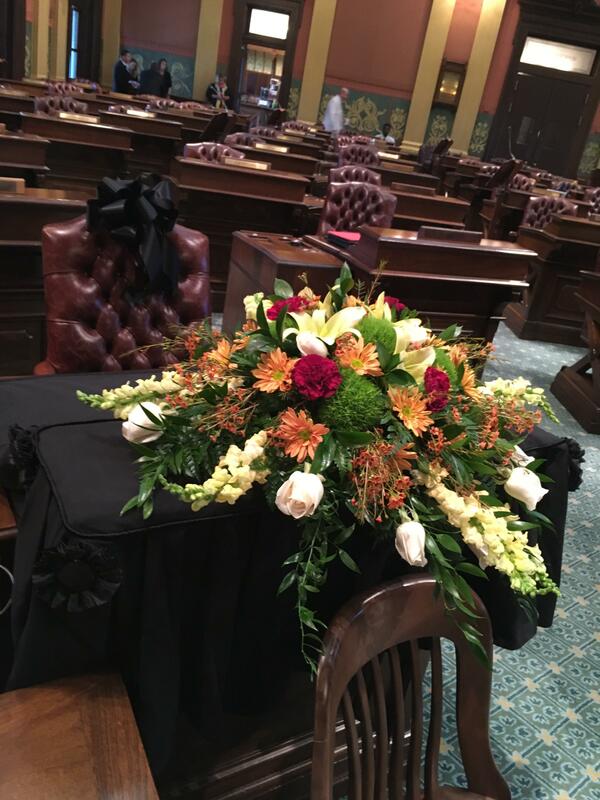 Black ribbon and a spray of flowers cover the desk of the late state Representative Peter Pettalia (R-Presque Isle), who died Monday evening in a motorcycle accident on his way to the legislative session in Lansing. Lawmakers returned to the state Capitol Tuesday to the news that state Representative Peter Pettalia (R-Presque Isle) was killed Monday evening in a motorcycle crash. The desk of state Representative Julie Plawecki (D-Dearborn Heights) also remains vacant after she died this summer from a heart attack. House Speaker Kevin Cotter said Pettalia would be missed by many. State Representative Ed McBroom (R-Vulcan) remembered Pettalia’s warmth and sense of humor as he delivered a prayer and eulogy at the opening of the day’s House session. Pettalia was killed Monday evening in a motorcycle crash on M-33 in northern Michigan’s Montmorency County. Pettalia sponsored a bill that helped to lead to the repeal of Michigan’s mandatory helmet law, but the Michigan State Police say he was wearing a helmet when he was killed. The House’s business for the day was largely scrubbed, and plans for roll call votes were canceled as staff, friends, and colleagues mourned. House Speaker Kevin Cotter said this of Pettalia. Pettalia chaired the House Transportation and Infrastructure Committee. He was in his third and final term serving in the state House. Before serving in the House, he was a local elected official, small business owner, and volunteer fireman. Medical marijuana clinics in Michigan would have to be licensed and pay sales taxes under bills adopted by the state Senate. The Michigan Public Radio Network's Rick Pluta reports on the state Senate voting in favor of medical marijuana dispensaries selling edible marijuana. Seven schools have been released from the state’s list of lowest-performing schools. But 184 schools are still on the list. The Michigan Public Radio Network's Cheyna Roth reports on the latest "Priority List" from the Michigan School Reform Office.